Natural resources, politics, physical barriers and limitations to how we use it. 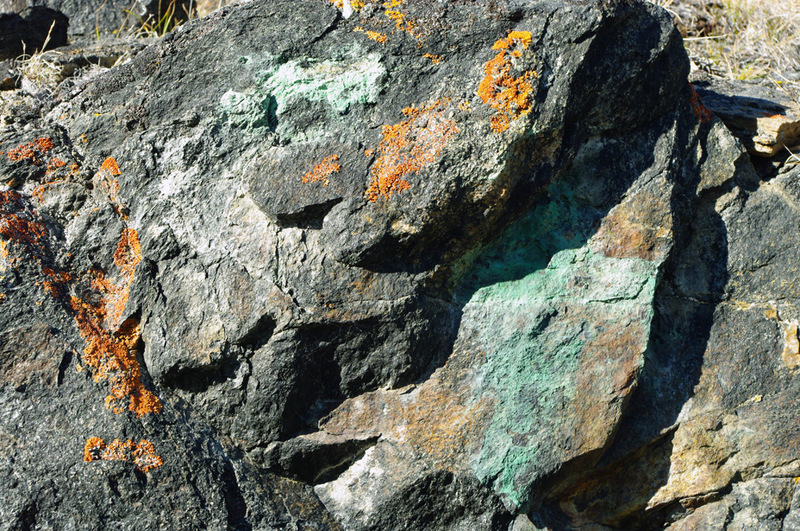 Copper minerals in rock It is difficult to tell accurately what mineral resources Antarctica has as they are buried in rock that is covered by a thick ice sheet. It is thought to have large and valuable mineral deposits under the ice. This is because of what has been found in samples taken from the small areas of rock that are exposed, and also from what has been found in South Africa and South America which share rock strata as Antarctica was was once attached to them millions of years ago. Up until 180 million years ago, Antarctica was a part of the Gondwanaland super continent, attached to South America, the Southern part of Africa, India and Australia, these continents then drifted apart until they reached their current positions. Antarctica shares some types of fossils with South America and South Africa and also some rock formations, leading to a possibility that it may also share some of the mineral wealth of these continents. For the time being however, it is mainly guess work and an accurate geological or mineral map of Antarctica is impossible to produce on any great scale. Coal has been found in commercially attractive quantities, but no other minerals have been found in quantities that are currently commercially viable. Antarctica is in an ice age, and development of the land mass in the future is unlikely. It is believed that oil and natural gas are to be found in large quantities in Antarctica's continental shelf though these are not currently being exploited. The most extreme cold on the planet. A very thick ice sheet. Isolation from any town, city or industrial development. Having to cross the roughest seas on the planet to get any cargo back to the industrialized world. Gigantic icebergs like multi-million tonne ploughs that threaten shipping, platforms and pipelines. The annual "icing-in" of the continent when the area around the coasts freeze so that only the most powerful (and expensive) ice breakers can get through. Oil and gas from the continental shelf are the most likely resources that may be exploited, but this is still a good distance in the future. The shelf areas are not covered by the Antarctic Treaty unlike the continental zones and therefore are not subject to the same protection. Antarctica has huge wildlife resources which have been disastrously exploited in the past, notably whales and seals. There are a large number of ships that go into Antarctic waters to catch fish (the protected "Patagonian toothfish" is particularly sought after by unscrupulous fishing captains) and especially squid. Squid fishing boats are thought to be starting to pose a threat - particularly in sub Antarctic waters - to the food available for many native species of penguin and seal. Krill exploitation was at one time thought to be a great possible food source for man, though this has not proved to have been the case. The problems being that krill doesn't keep for long and must be processed immediately before it goes off, also consumer reaction has not been good (it doesn't taste very nice in other words). At the present (2018), it seems that the main exploitation of Antarctica in the near future will be for tourism. There is an ever increasing tourist interest in Antarctica and numbers of visitors have been rising continuously since the first voyage in the 1960's. Tourism is presently confined to cruise ships on 1 to 2 week tours with landings of a few hours around the peninsula or islands. This is already having an effect - visitors to a pristine environment such as Antarctica will always have some environmental impact. There have been plans put forward for a hotel and even a casino on the Antarctic continent itself though fortunately these have as yet come to nothing. Tourism may yet help to protect Antarctica. It is unlikely that the continent will remain as relatively unvisited and pristine as it has so far and tourism is seen by many to be the lesser of the available evils. Almost by definition, it must remain beautiful, untouched and abundant in wildlife in order to remain attractive to tourists. The industry must be regulated however, this poses a problem as Antarctica does not come under any one national jurisdiction and so regulation currently is largely one of self-regulation and restraint by the tourist industry and the tourists themselves. For further information on the exploitation of Antarctica, see Conservation / Environment links, also below Who owns Antarctica? The two poles are complete opposites in that the North Pole is an area of sea surrounded by land, whereas the South Pole is an area of land surrounded by sea. The first reason that the North Pole is warmer is that the presence of the sea has a large effect on the temperature in the vicinity. Sea water freezes at about -2°C, so whenever sea is not frozen, the temperature of the sea cannot be any lower than this. This still has an effect even when the sea is covered with a thick layer of ice and keeps Arctic temperatures (although still incredibly cold) generally above those of the Antarctic. The second reason is due to the thickness of the Antarctic ice sheet. The South Pole is 2385m above sea level, the average elevation of Antarctica is 2300m and the highest point is about 4000m. With every 100m you climb, the air temperature drops by 1°C which puts the average temperature of Antarctica 23°C below the already cold coastal temperature. The North Pole by comparison is at a maximum altitude of just a few meters above sea level - and that's when a large lump of ice is passing by. The third reason is due to the isolation of Antarctica far from the other landmasses on earth. It is isolated in the main from the rest of the world's weather in a way that the Arctic isn't. It doesn't get any warm air spilling from nearby continents as does the Arctic from Canada and Russia. Warm air from the tropics that finds its way northwards finds it much more difficult to do the same southwards. Antarctica generally has its own weather systems that rush round and round the continent having nothing to do with the rest of the world. Antarctica has no native population or permanent residents. In this sense it was truly the first and only continent that was "discovered" in that there weren't any people already living there. No-one had set eyes on Antarctica before 1820. Early explorers and then later on, whalers and sealers, were literally the first people to ever set eyes on Antarctica. As the 20th century progressed various countries set up permanently manned scientific bases. A combination of scientists and specialist support staff would spend from a few months to a couple of years before handing over to the next party arriving. This pattern has continued to the present day, with more and more bases being opened, some closed down, some buried and some literally drifting away as the part of the ice shelf that they were built on, broke off and became an iceberg. So the answer to the question "Who lives there" is "no-one". Antarctica is occupied by a succession of visitors, measured in thousands in the summer and hundreds occupying the various scientific bases in the winter. The Antarctic Convergence (also known as the Antarctic Polar Front) marks the true outer edge of Antarctica. It is a circumpolar strip of sea around the southern most reaches of the Atlantic, Indian and Pacific oceans varying between about 45° and 60° South. It's exact position is somewhat variable, but it is a very real and permanent feature. The surface temperature changes by 2-3°C from one side of the convergence (polar front) to the other, there are also changes in the chemical composition of the water. There is sufficient difference across the convergence that the seas around Antarctica are known as a distinct "Southern" or "Antarctic" ocean, rather than simply being the most southerly parts of the Atlantic, Indian and Pacific oceans. The strip of water that comprises the Antarctic convergence is around 40km wide and it has been in existence for about 20 million years. It is not fixed in place, but usually stays within about half a degree of latitude (35 miles) of the average position, a broad ribbon drifting back and forth. During this time there has been little exchange of marine life from one side to the other. For instance, there are virtually no Decapod Crustaceans (crabs, lobsters etc.) in Antarctica, despite their being found in quantity elsewhere in the world's oceans including the Arctic. The convergence is a complex and turbulent area. Sea water that has cooled dramatically around the Antarctic continent and so become heavier, starts to flow northwards along the sea bed. It meets deep, warmer south-flowing water from equatorial regions at the Antarctic convergence which results in an upwelling of the deep waters to the surface. This upwelling brings a great many dissolved nutrients with it which acts like fertiliser for the southern ocean and is the reason that the seas around Antarctica are so surprisingly productive despite the cold temperatures. In the early decades of the 20th century seven nations, Argentina, Australia, Chile, France, Great Britain, New Zealand, and Norway announced territorial claims to parts of Antarctica. In 1961 the Antarctic Treaty was signed by these nations and others and these territorial claims put aside in the interests of international cooperation in scientific research. 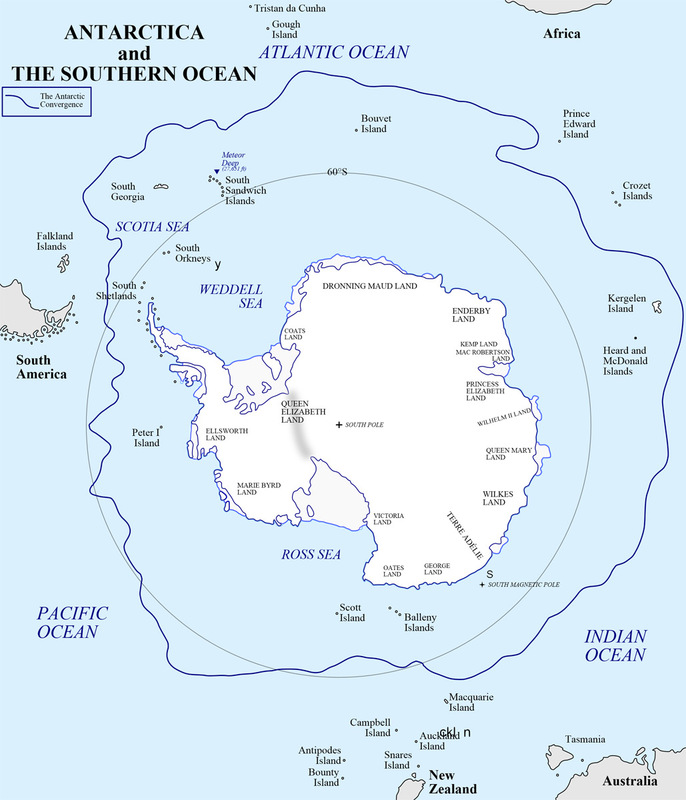 A prelude to the Antarctic Treaty was the systematic exploration and scientific investigation of Antarctica which properly began with the International Geophysical Year (IGY), July 1st 1957 to December 31st 1958. 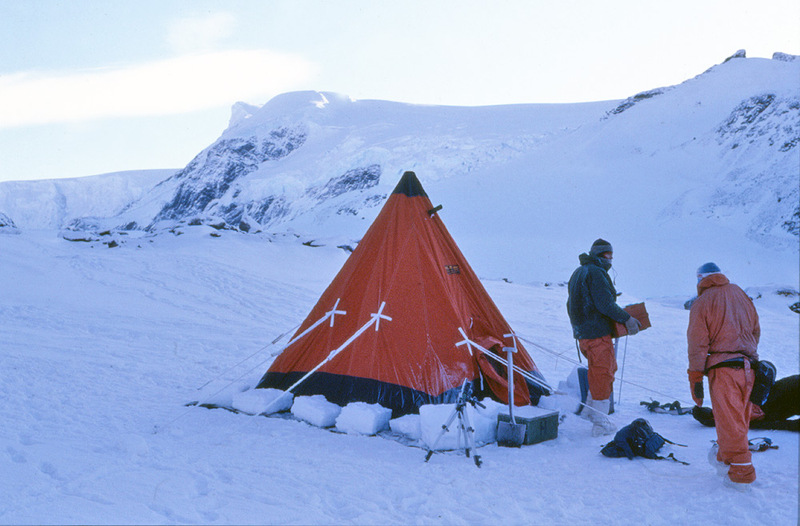 35 scientific stations were established on the Antarctic continent with another 15 on sub Antarctic islands by 12 different nations during the IGY. The IGY was such a success that the benefits of international co-operation seemed well worth continuing. The IGY was therefore followed by a year of International Geophysical Cooperation when the 12 nations (Argentina, Australia, Belgium, Chile, France, Japan, New Zealand, Norway, South Africa, USA, USSR and the United Kingdom) decided to continue their research. Representatives of the 12 nations met in Washington, D.C. in 1959 to draft and sign the Antarctic Treaty. This agreement dedicated the entire continent to peaceful scientific investigation. It came into effect in 1961 and all territorial claims were suspended. In 1991, 24 nations approved a protocol (addition) to the treaty that would ban oil and other mineral exploration for at least 50 years, so put 2041 in your mental diary and contact your representative or president at the time. The answer to "Who owns Antarctica" is "no-one and everyone".